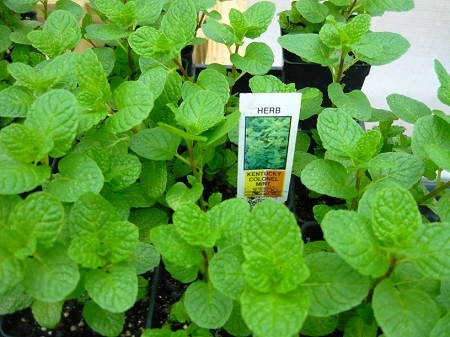 KENTUCKY COLONEL MINT (Mentha spicata cv. )- Spearmint variety used for making Mint Julep. Excellent flavor also good in tea, jellies, and for other culinary purposes. Large rounded and pebbled leaves, robust growth habit. Easy to grow perennial zones 5-10. Live plant in 3 inch container. They say Kentucky Colonel mint is the classic ingredient for a julep. I'm still partial to spearmint for it's slightly sweeter taste, but this mint is definitely a rock star. I'm had it for about 1-2 months and it's thriving in the sun. The leaves are huge (much bigger than other mint plants) and the plant has doubled in size. I love that it's a perennial, too, so I don't have to buy a new one next yr if I don't want to. My advice to others is to bring the plant inside or cover it for the winter. I previously had this type of mint for a few yrs but last yr was unusually cold & the plant didn't come back to life in Spring. Has more than doubled in size in 10 days! This mint has a lovely scent but I have yet to use it in anything. But after following their re-potting instructions, it has more than doubled in size since I received it 10 days ago. I am very pleased with the vitality of all the plants I've purchased from Colonial Creek.